If you’re looking to make a statement and drive one of the best SUVs in the industry at the same time, you drive an Escalade. The 2014 Cadillac Escalade ESV is for drivers seeking to make a statement with large families or a ton of cargo, and its sleek, sculpted lines and bold front grille leave no questions in the minds of on-lookers as to whether or not you’re driving a Cadillac. The 2014 Cadillac Escalade ESV is powered by a sole 6.2-liter V8 that pumps out 403 horsepower and 417 lb-ft of torque, which propel the Escalade ESV from 0-60 mph in just over seven seconds – an impressive mark for a large SUV. Unfortunately, unrivaled performance and the ability to haul eight passengers come at the expense of fuel economy. The 2014 Cadillac Escalade ESV’s high-performing V8 only returns 14 mpg city and 18 mpg highway. According to Edmunds.com, “the 2014 Cadillac Escalade ESV offers a handsome cabin with an upscale look enhanced by high-quality materials.” It is a luxury SUV after all, and the Escalade ESV has the comfort and technology to warrant the distinction, including a rear seat video entertainment system, tri-zone automatic climate control, navigation, rearview camera, Bluetooth audio and phone connectivity, and a 10-speak Bose sound system. The 2014 Cadillac Escalade ESV is the definition of a luxury SUV. 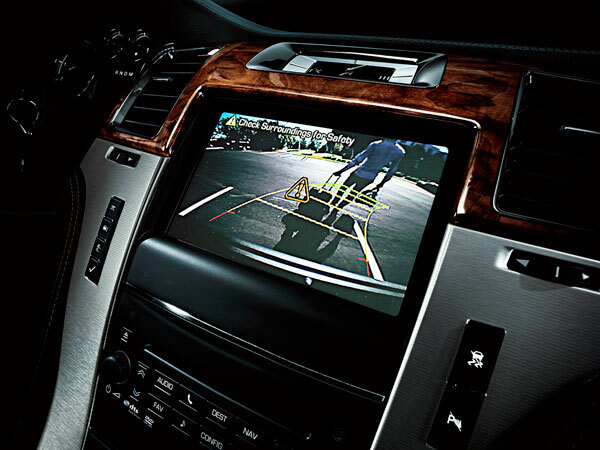 The 2014 Cadillac Escalade ESV comes with an extensive list of standard features to keep its numerous passengers safe, including traction and stability control, antilock disc brakes, rear parking sensors, a rearview camera, and a comprehensive suite of airbags.